SB 1581 approaches education in two major ways. We need to impart reading and math knowledge of a specific type and then test children to see if they have attained this knowledge. And we need to make sure children finish our proscribed learning. The entire bill centered on these two things. Even parts directed at absenteeism supported this premise. If you are absent too much you won’t be there to either pass your tests or graduate. Many people looked at the section of the achievement compacts which allowed districts to set their own goals (called outcomes in the bill) and surmised this is where the flexibility was. Districts could determine what things were important to their community and pursue them. However, the state is willing to accept only measurable pursuits, and the idea of measuring eliminates much of what makes for a good education because of how this will be interpreted both by the state department of education and school boards. For instance, can a district have as a goal encouraging a better understanding by their students of the world in general concerning geography, history, religion, and social movements combined? And how would you then measure this? I imagine any community of educators would understand the incredible importance of this type of education. But there is not much chance a school board will put this in its learning compact and thus focus on it. How about creating interest in the pursuit of the arts, healthy athletic activities, recreational reading, and/or other creative interests which might carry over into adulthood? Any community of educated citizens would think this is a major goal of a good education. But it can’t be measured really and what school board would put it in its compacts? None that I know of. And how about educating children to challenge ideas and create a context (absolutely necessary) on which to base their future knowledge? I can just see the achievement compact: we are going to create general and specific contexts upon which students can base their future learning including challenging what they read, see, or think about. Can’t be measured. Nobody will do this. So in 1581 we have direction which forces school districts to focus their time, energy, and money on a small section of what is important to the huge detriment of very, very crucial educational goals. The discrimination comes because upper-economic schools already have large numbers of kids who pass the tests, who attend school regularly, and who graduate. They can still focus on the large themes of education. So their students are only minimally affected by the bill. But the administrators and teachers in poorer schools are forced to focus on the narrow tracts outlined in the bill. Well, people might say, yes but students need to first pass basic tests before they can pursue other parts of education. There are two main things wrong with this. First, students learn to read over a long continuum. Someone reading close to grade level will move forward if they develop interests and have other opportunities to learn, but they don’t show up as passing the test. Yet these students receive a disproportionate amount of the attention since they are much easier to get to benchmark than the kid three years behind who genuinely needs all the extra help directed at reading or the kid who is way ahead who needs to be encouraged also. Second, Title 1 schools have huge numbers of kids, who, although not of wealthy parents, do just fine in reading. Often over 50%. Yet these students are treated to a test-based education which drastically narrows their curriculum and forces their teacher to teach to the test way more than appropriate. SB 1581 helps continue this type of discrimination, not alleviate it or even take it into account. 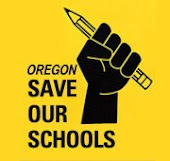 Add to this the discipline problems, the lack of parent support, the lack of interesting electives or activities, less use of technology and various other disadvantages associated with these schools then it is easy to see why our organization, Oregon SOS, worked against this bill. We wanted real education to be addressed in an equitable manner.